Truly, for some men nothing is written unless they write it. 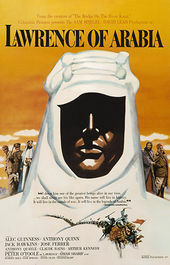 The opening scene of director David Lean’s 1962 epic Lawrence of Arabia is the end for its titular character, acting both as prologue and epilogue. Moments after the main title sequence concludes and the final credit fades, T.E. Lawrence (Peter O’Toole) is killed in a motorcycle crash on a quiet road in South West England. Lawrence’s death is the viewer’s introduction to the decorated British Army officer and controversial hero of The Great War – a figure whose exploits and global accolades would seem to preclude such an inglorious fate. And yet it is here outside a quaint cottage in Dorset that we first meet Lawrence, filling the oil tank on his Brough Superior motorbike before heading out for a ride. With the exception of composer Maurice Jarre’s music – which bounces between jaunty and sweeping – Lawrence of Arabia’s main title sequence stands in stark contrast to the rest of the film. The music promises high adventure and romance, but the images presented do not reflect that mood. The only life on screen is Lawrence, walking into frame just as the film’s title card appears. His drab suit a far cry from the flowing white robes that carried him through the desert, the dull grey of the courtyard no substitute for the endless red and yellow sands of The Nefud. The motorcycle is Lawrence’s only respite from the ordinary, a means to return to some place, some oasis thought swallowed up by the desert long ago. Many dream of such a return, but for some it is their undoing. Lawrence of Arabia’s title sequence was shot over several days in Almeria, Spain in the summer of 1962. 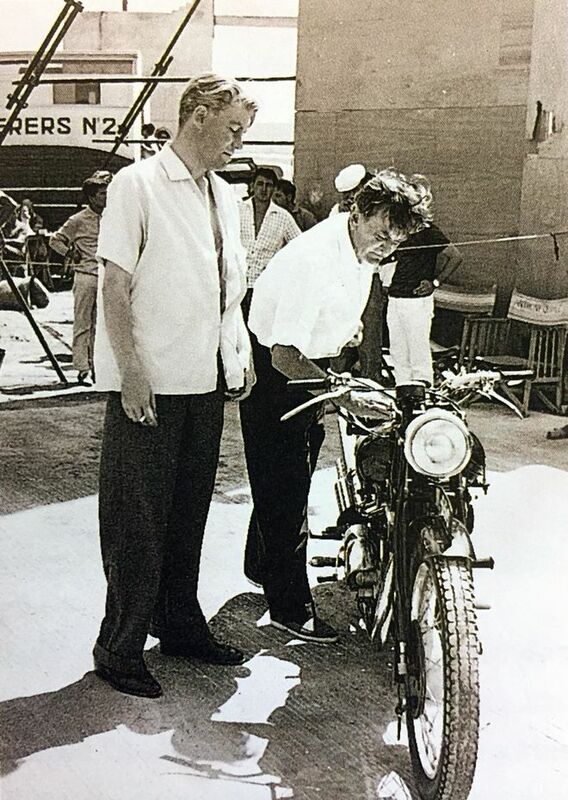 A Brough Superior SS100 motorbike – a hand-built motorcycle nearly identical to the one Lawrence rode on the day of his death – was shipped from England for the shoot. In the absence of an English courtyard, a wooden stage was painted to resemble pavement and a high angle was used to hide the scene’s decidedly Spanish surroundings. (It is possible this unique high angle shot may have inspired the opening of director Jacques Demy’s 1964 film The Umbrellas of Cherbourg.) The scene immediately following the title sequence, in which Lawrence is seen riding off to his doom, was actually shot in Surrey, England several months later – a fact that is immediately apparent for several reasons, not the least of which is the marked difference in lighting between the two shots. The hard light of a summer’s afternoon in Spain is difficult to mistake for a muddy fall day in England. While elaborate, standalone title sequences were already in vogue in Hollywood when Lawrence of Arabia went into production (thanks largely to the work of Saul Bass), at the same time new widescreen camera systems like TODD-AO and Super Panavision 70 were being introduced to provide audiences with new visual experiences as well. Lawrence was one of the first films to be photographed using Super Panavision 70, and so its producer wanted to take full advantage of this new system. Why waste precious frames on an animated title sequence when your camera can capture images with such incredible fidelity and scope? During the opening, the ultra wide 2.20:1 image allowed Director of Photography F.A. Young to comfortably frame Lawrence and his bike in one part of the screen and the credits type in the other. Although comparatively plain to look at in view of the rest of the film, Lawrence of Arabia’s opening sequence is a beautifully presented hint to viewers this movie will require them to take in every part of the screen. Although technically brilliant and beautifully simple, the opening title sequence – specifically its credits – would become a point of contention for nearly four decades as detailed in Adrian Turner’s book The Making of David Lean's Lawrence Arabia. 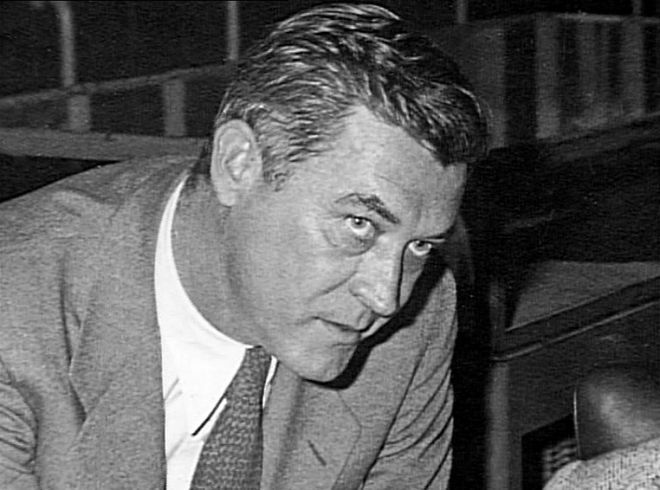 Lawrence of Arabia’s original screenwriter, Michael Wilson, had been blacklisted by the House Un-American Activities Committee (HUAC) in 1951, but continued to work throughout the 1950s either under a pseudonym or without credit. Wilson along with fellow blacklisted writer Carl Foreman had been denied a screen credit on director David Lean’s previous film, The Bridge on the River Kwai (1957), for this very reason. That film eventually won the Academy Award for Best Adapted Screenplay (then called Best Writing, Screenplay Based on Material from Another Medium), but instead of going to Wilson and Foreman the award went to French author Pierre Boulle, upon whose book the film was based. Boulle, who had nothing to do with Kwai’s screenplay and did not speak a word of English, was the only writer given credit on the film due to Wilson and Foreman’s blacklist status. In correspondence with Wilson, Lean blamed this screen credit slight on producer Sam Spiegel. However, as many who have written about the filmmaker have noted, it is difficult to believe a director with Lean’s authoritarian reputation would have been unaware of such an omission, particularly in the politically charged climate of the late ‘50s. Despite Wilson’s negative experience on The Bridge on the River Kwai, the screenwriter eventually became involved in Lean and Spiegel’s next project: an adaptation of T. E. Lawrence’s autobiographical tale Seven Pillars of Wisdom – the film that would become Lawrence of Arabia. Although the Hollywood blacklist ostensibly ended in 1960 when screenwriter Dalton Trumbo was publicly credited for his work on Spartacus and Exodus, the insidious effects of the ban lasted for many years afterward, especially where works produced during the blacklist were concerned. 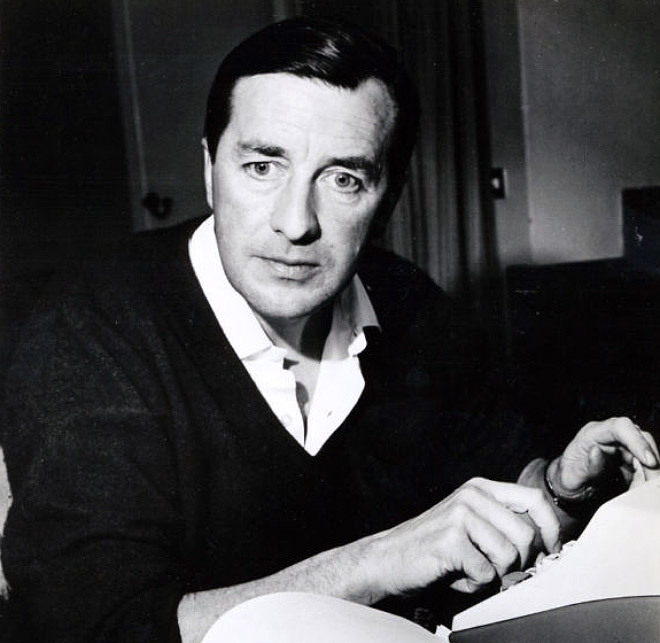 Wilson, who had begun work on the Lawrence of Arabia screenplay in 1958, signed a contract that stated the film’s producer would do their best to secure the writer screen credit in the “Western Hemisphere”, but even during the waning years of the McCarthy era that was hardly an ironclad guarantee. After working on the film for nearly 15 months and turning in three completed drafts, Wilson departed the project over creative differences with Lean, who reportedly disliked the screenwriter’s focus on the political aspects of Lawrence’s story. Lean then hired A Man for All Seasons playwright Robert Bolt to rewrite Wilson’s script, transforming the film from a complex historical drama into the more focused character study that would ultimately be produced. Upon reading Bolt’s finished screenplay, Wilson sent a letter to Lawrence of Arabia's producer, Sam Spiegel. Wilson noted that while little of his original dialogue remained in the shooting script, numerous original scenes he’d devised for the earlier drafts remained intact, both in terms of their structure and order in the film. He requested a joint screenwriting credit with Bolt. Spiegel’s lawyers replied to Wilson stating that the screenwriter had no contractual right to demand a credit and thus would not be given any. In spite of Wilson’s last minute appeals to the Writer’s Guild of America, Lawrence of Arabia premiered on December 10, 1962 without his credit. In a subsequent appeal to the WGA, Wilson outlined the scenes and structural similarities between he and Bolt’s respective scripts, making the case that his contributions to the finished film were enough to warrant recognition. Under the Guild rules of the time, in order for a screenwriter to receive a screen credit, he or she must have contributed at least one-third of the final screenplay, both in terms of structure and continuity and/or dialogue. After a lengthy arbitration process, the WGA would eventually side with Wilson, but sadly the writer would not be credited on screen until nearly 25 years after his death. One major difference between Wilson and Bolt’s respective Lawrence scripts was, ironically, the source of all the trouble: the film’s main title sequence. While Bolt’s screenplay outlines what eventually ended up in Lean’s film almost beat for beat, Wilson’s script envisaged an opening less about the man, T.E. Lawrence, and more about the myth of ‘El Aurens’ – Lawrence of Arabia. The main title and credits were to have appeared over a shot of a ruined temple, seven stone pillars lying broken and partly buried in sand. Not only is this image a direct allusion to the title of Lawrence’s Seven Pillars of Wisdom – an account of his wartime experiences and the basis for Wilson’s screenplay – but it is symbolic of the ultimate impermanence men’s deeds, great or otherwise. As written, both Wilson and Bolt’s opening sequences have much to say about Lawrence, servicing the character and the film’s story in different ways. However, Bolt’s version was the one filmed, and the one now emblazoned in the minds of generations of film watchers. 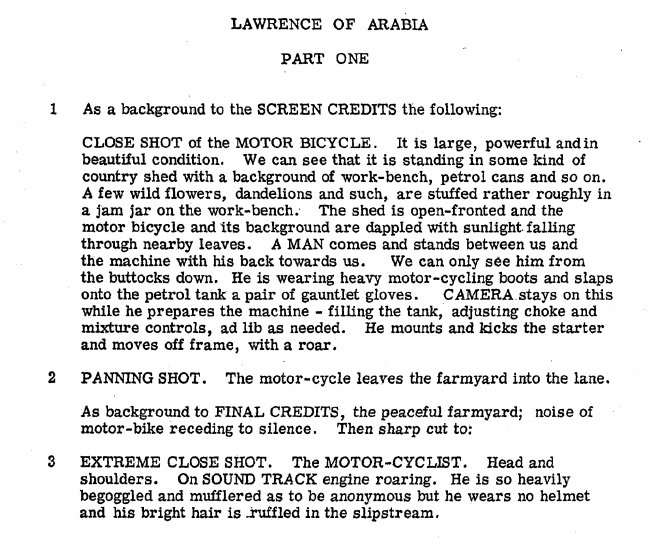 An excerpt from Robert Bolt's Lawrence of Arabia (1962) screenplay detailing the main title sequence. Michael Wilson died in 1978. Despite the WGA ruling in his favour shortly after the release of Lawrence of Arabia, he never lived to see his screen credit added to the movie. Wilson’s family reportedly lobbied Columbia Pictures with the support of the WGA when work began on the director’s cut of the film in the late 1980s, but failed to secure approval from Lean. The film was again released without Wilson’s writing credit in 1989. It was not until 2002 – the 40th anniversary of Lawrence’s release – when Sony Pictures undertook a digital restoration of the film for a DVD release that Wilson finally got his on screen credit, which has remained in all versions of the film released since. A discussion with GROVER CRISP, Executive Vice President, Asset Management, Film Restoration & Digital Mastering at Sony Pictures. I was fascinated to learn that blacklisted screenwriter Michael Wilson had his credit added to the restored version of Lawrence of Arabia in 2002 some forty years after the original release. Could you tell us about the decision to do that and what the process involved? Grover: For the 40th anniversary 2002 release of Lawrence of Arabia, both on film and for the DVD releases, we wanted to add Michael Wilson to the credit for the screenplay. Some years earlier, the WGA made the determination that he deserved credit and that the studio should give him that credit in the future releases of the film. This film posed some problems in that the main titles are over one continuous, locked-off shot, which meant it would be difficult to add the name for the film prints. On video, we would be able to digitally make the addition, but I wanted to be able to make film prints with the corrected credit. So, we undertook to recreate the entire main title credits by using the original textless background shot, which we had on 65mm negative. I understand that Pacific Title spent two months rebuilding the titles for the 2002 restoration. Grover: We worked at Pacific Title, as you mentioned. I can’t recall who specifically worked on recreating the font style, which was unique to the film. We scanned the composited film elements and transferred to the video master, but also had a negative that we could print from, bypassing what was actually on the original negative, without the Wilson credit. I thought the work done was really nice and we used it for the film prints and for the DVD releases on video. Another item, the Columbia Lady logo at the head, was also unique: a still painting of the logo that was used only on this film. Are there any differences between the 40th and 50th anniversary releases of Lawrence of Arabia in terms of the main title sequence? Grover: When it came time for the 50th anniversary release in 2012, we decided not to use the credit shot that was created for the 2002 release and, instead, we used the credits in the original negative, to make it as authentic as possible. Grover: We digitally added the Wilson credit here at the studio with all the other credits unchanged from the original. We had a graphics/special effects artist map the font style and recreated it. Was fairly simple and straightforward this time. And, since we were not making film prints this time, but 4K DCP for the theatrical release, it worked out really well. Are there any other films from the blacklist era that have had their credits restored in this way? Grover: This was not the first time we have done this. 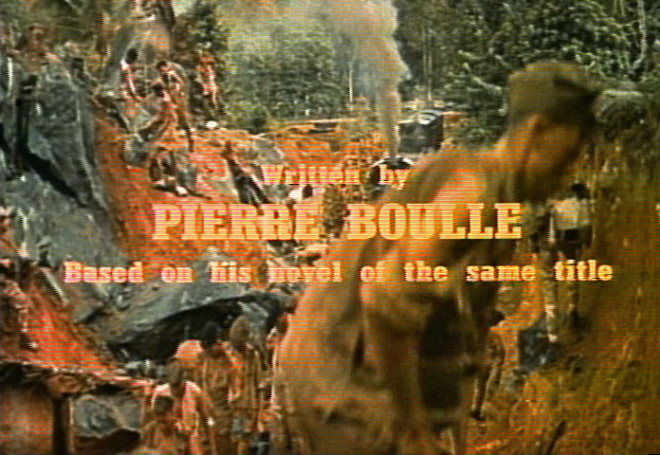 Wilson and Carl Foreman were blacklisted at the time they wrote The Bridge on the River Kwai and the credit on screen went to the writer of the novel, Pierre Boulle. Grover: When we were working on a prior DVD release of Bridge, we used the elements created in the early 90s for a release of the film on print. At that time, they had access to the 35mm textless background, but the main titles are over a series of shots with hard cuts and dissolves. So, they were able to create the screenwriter credits and, as I recall, one other credit, since both credits were in the same shot. The match to the font was okay, but not very precise and slightly different in colour. When we did the 4K restoration a few years ago, we faced the same situation. The main title sequence for Bridge has always been troubling from a quality perspective in that some of the optical duplication work was okay, some really dreadful, making it difficult to get good resolution and colour out of the film elements themselves. So, when we worked on the 4K restoration and got a good look at the full textless background we saw that it was actually a much better element than the optical title sequence cut onto the original negative. In this case we wanted to try to make use of it as best we could. Grover: In the final analysis, we decided to recreate the titles in their entirety, allowing us to seamlessly add the writers credits, but also giving us a somewhat better background than we would have had, in both colour control and sharpness. Our graphics/special effects artist did a magnificent job on those credits, again a unique font style, particularly the main title itself. We mapped over the original, of course, but there were tweaks and corrections here and there to have it as authentically identical as possible. No one ever commented on it to me, so I guess no one ever noticed it.